Over a quarter of a million men, women and children in the UK need access to public toilet facilities that go one step further than traditional ‘disabled toilets’. Facilities that simply have a handrail next to a toilet are just not sufficient for people with very complex needs or profound and multiple learning disabilities. Nathalie Vallaeys is one of HFHC’s Ambassadors. She regularly meets parents of young people with very complex needs in the South of the country. She explains: “I know from speaking to parents of children and young people in wheelchairs that there is a shocking shortage of toilets equipped with a hoist and a bench. “Even in places like a busy outpatient children’s clinic in London, there are no suitable toilets to accommodate a wheelchair user in need of this equipment. Similarly, I am hearing that going out on a leisurely activity in London with a child or young person in a wheelchair is an almost impossible task: Kew Gardens are amongst the very few places which have a wheelchair accessible toilet equipped with a hoist. 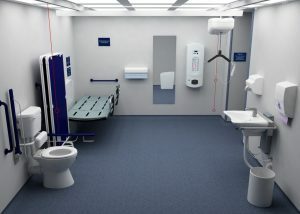 Despite the huge number of people requiring facilities such as a tracking hoist system and a height adjustable, adult-sized changing bench, there are only around 1,000 suitable toilets in the UK. While more and more businesses, events and attractions are attempting to cater for people with complex needs, the toilet facilities are simply not suitable, creating a further barrier to people with complex needs accessing these events or attractions. This shouldn’t be the case.